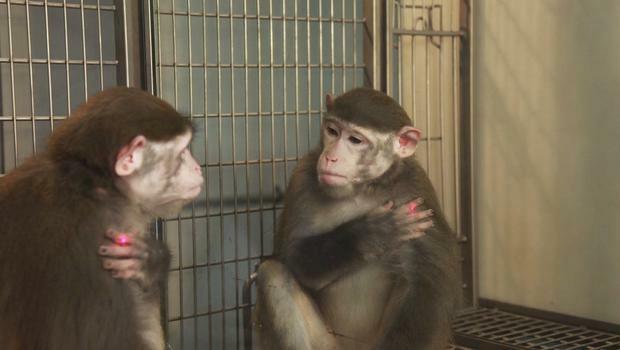 Some researchers have recently found that some great apes and also chimpanzees, orangutans, bonobos and gorillas can recognize them in a mirror if they are trained. Generally, they cannot recognize their reflection in the mirror. But some Chinese researchers proved that they can be taught that they can see their own face from the mirror. Several tests and training has been conducted. For example, a standard mirror test by putting a dye spot on their face and see whether they touch the spot or not. Another test was conducted by using a laser device. Laser device make a red light dot on their face causing a sensation irritation for monkeys. This one was then used as training procedure by rewarding them with food for recognizing the red dot for several time. Thus they realize that the face shown in the mirror was their own face. Moreover, human patients of autism, schizophrenia, Alzheimer are also unable for self-recognition. The researchers think that these patients can also be remedied from the impairment of self-recognition by training.